Trying to make a Knight for my game (original huh). I have read a bunch of tutorials but when I get down to draw it never comes out very well..
Any ideas. I feel like the helmet is kinda okay but for the rest i was just guessing..
Metallic: I like to do nonlinear gradients such as (1). Sometimes I pop the highlight, sometimes I don't. Sometimes I don't even go up into the brights. Too many highlights are distracting, so place them at points of focus. Linear gradients like (2) can be useful but are mostly not useful for describing form and contrast.They're just sort of easy to make (IT'S A TRAP!). What else. 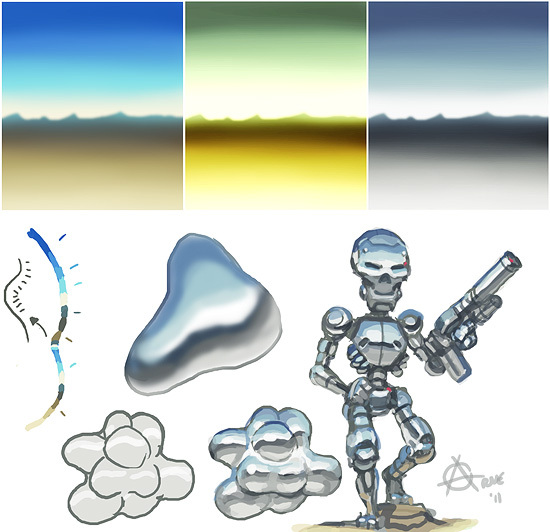 Yes, I often add a dirt and sky color to my silvers. Planes facing down tend to reflect warm colors, and planes facing up tend to reflect cool sky colors. If we're outside playing in dirt that is (knights often were, I suspect). On a small character like this you generally don't need a whole lot of colors. There's simply no room for elaborate gradients. Each pixel is more likely to play a role in showing some kind of detail or contrast point. Wow! thanks! I will use a lot of your art. Damn, it is going to take me a loooooong time to get a hang of this..
edit 2. I am totally newbie at this (have only started doing this after I need afterwork for my game). But, how do you figure out the non-linear gradients? none of the tutorials i have read said anything about it..
Yeah, my edit is exactly the same size, except maybe a pixel extra here and there on the silhouette (skirt and the leg behind). 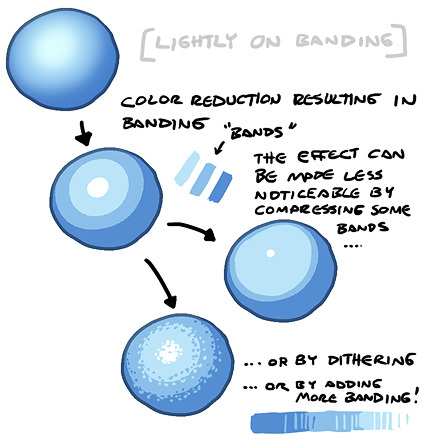 "Gradient" or "Shading" is not something that's easy to figure out at all. There are so many situations which give rise to different looks. It's however generally effective to decide on a shadow color and a light color, then render the figure mostly with those two, and minor extra dark and extra light regions where needed. 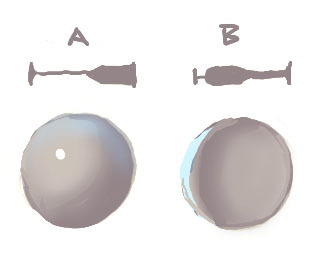 However, metal is different since it's gloss so the values (dark to light) can really go crazy. Thanks again, The nonlinear gradiants really make the different feautures of the knight stand out.